Two exceptional Emory College creative scholars — music major Michael Crawford (left) and creative writing major Darby Jardeleza — are the 2017 recipients of the Louis B. Sudler Prize in the Arts. 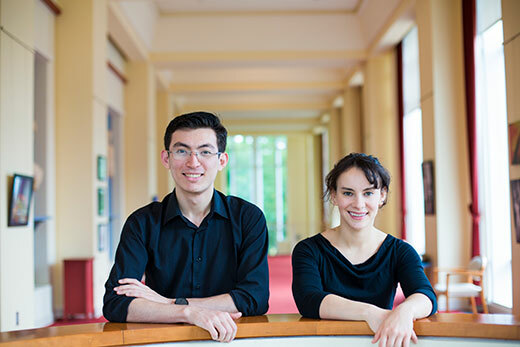 Two exceptional Emory College creative scholars — music major Michael Crawford and creative writing major Darby Jardeleza — are the 2017 recipients of the Louis B. Sudler Prize in the Arts. Awarded annually to the graduating senior or seniors who have demonstrated the highest standard of proficiency in one or more of the performing or creative arts, each Sudler Prize is accompanied by a $6,000 award. Arts faculty who have mentored the students say they are two of the most extraordinary and accomplished undergraduate students to ever study in their respective departments. Music major Michael Crawford, from Loganville, Georgia, graduates May 8 with concentrations in violin performance and composition. Crawford’s strong work ethic coupled with his extraordinary artistic talent produced a remarkable undergraduate career. The current EUSO Concertmaster, Crawford won the EUSO Concerto and Aria Competition performing the Barber Violin Concerto in his junior year. He is a two-time recipient of the Department of Music’s competitive Blumenthal Award for undergraduate composition, an unprecedented achievement. This spring, for the first time in the history of the department, Crawford completed both an honors recital in composition and a full senior recital in violin performance. Crawford, who will begin graduate study in music composition at Temple University this fall, says that his Sudler award is a testament to the department that nominated him. During fiction writer Darby Jardeleza’s time at Emory, the creative writing major and Arabic minor from Bluffton, South Carolina, has demonstrated a talent for storytelling that, to her professors, goes beyond even graduate-level work. Jim Grimsley, a faculty adviser to Jardeleza, echoes Skibell’s praise. “She has a talent that is truly extraordinary, an ability to write delicate, beautifully conceived short stories in a prose that is pristine, mature, and full of poetic nuance. Jardaleza, who is the co-founder of the Emory Literary Club and the 2016-2017 Stipe Society of Creative Scholars Creative Writing Fellow, plans to take a gap year before applying to Master of Fine Arts programs. Looking back on her time at Emory, Jardeleza credits the Emory Creative Writing Program with much of her success. “My Sudler nomination is just another example of the incredible help and support I've received from my professors in the Creative Writing department, specifically Jim Grimsley and Joseph Skibell,” she says.